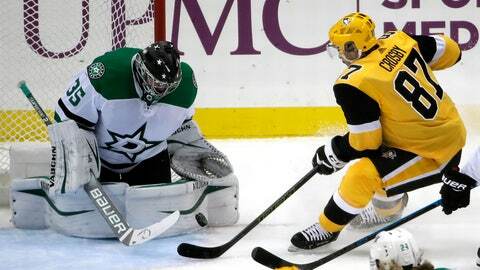 PITTSBURGH (AP) — Sidney Crosby returned from an upper-body injury to pick up a goal and two assists and the Pittsburgh Penguins drilled the Dallas Stars 5-1 on Wednesday night. The Pittsburgh captain missed three games after getting hurt last week, the latest setback during a forgettable early opening quarter of the season for the perennial Stanley Cup contenders. Crosby provided Pittsburgh with a needed spark. He set up Jake Guentzel for a goal less than 4 minutes into the game and provided a highlight-reel marker later in the opening period when he raced to the net and smacked in a rebound past Anton Khudobin to give Pittsburgh a three-goal lead. Evgeni Malkin, Patric Hornqvist and Tanner Pearson also scored for the Penguins. Two days after letting a 4-1 advantage disappear in a loss to Buffalo, Pittsburgh clamped down on the Stars. Casey DeSmith was rarely tested early and finished with 18 saves. Mattias Janmark spoiled DeSmith’s bid for a shutout with a third-period goal. Khudobin was pulled after Pearson beat him with a slap shot on the breakaway made it 5-0. Khudobin stopped just 11 of 16 shots. Rookie Landon Bow stopped 14 shots in his NHL debut. TAMPA, Fla. (AP) — Steven Stamkos had a goal and three assists and Tampa Bay beat Florida to reclaimed the top spot in the Eastern Conference. Nikita Kucherov and Ryan McDonagh each had a goal and two assists. Mathieu Joseph, Yanni Gourde, Adam Erne and Dan Giradi also scored, J.T. Miller had three assists, and Louis Domingue made 40 saves. The Lightning are 11-1-1 at home against Florida since the start of the 2013-14 season. Panthers left wing Mike Hoffman extended his points streak to 17 games (10 goals, 20 points) with a late third-period power-play goal. He is the fifth player in NHL history to have a points streak of at least 17 games in his first season with a franchise. Troy Brouwer and Aleksander Barkov also scored for the Panthers. NEW YORK (AP) — Alexandar Georgiev stopped 29 shots for his first career shutout, Filip Chytil scored for the fifth straight game, and the Rangers beat the crosstown-rival Islanders. Chris Kreider had a goal and an assist, and Cody McLeod, Neal Pionk and Kevin Hayes also scored to help the Rangers win for the ninth time in 11 games (9-1-1). Kevin Shattenkirk and Mika Zibanejad each added two assists in the Rangers’ seventh straight win at home, now by a combined 26-10 margin. The Rangers ended an eight-game skid (0-7-1) to the Islanders, who had won 12 of the previous 13 meetings, including a 7-5 win at home last Thursday night. WASHINGTON (AP) — Tom Wilson, Andre Burakovsky and Michal Kempny scored to give Washington an early lead, and the Capitals held off Chicago. Devante Smith-Pelly also scored and Braden Holtby stopped 37 shots to help Washington win its third straight. Brandon Saad, Erik Gustafsson scored for Chicago. Wilson, playing in just his fifth game after sitting out the first 16 because of a suspension, scored his second goal of the season just 54 seconds in after upending Chicago goalie Corey Crawford. BUFFALO, N.Y. (AP) — Evan Rodrigues had a goal and an assist in Buffalo’s four-goal first period, and the Sabres extended their NHL-best winning streak to seven games. Buffalo has its longest run since taking 10 games in a row to open the 2006-07 season. Jeff Skinner, Tage Thompson and Johan Larsson also scored in the opening period for the Sabres. Sam Reinhart added an empty-net goal in the third, and Carter Hutton made 23 saves. Claude Giroux and Wayne Simmonds scored for Philadelphia. ANAHEIM, Calif. (AP) — Ryan Getzlaf had a goal and an assist, John Gibson made 25 saves for his 100th career victory and Anaheim snapped a three-game losing streak with a victory over skidding Vancouver. CALGARY, Alberta (AP) — Sam Bennett had the go-ahead goal and Calgary scored five times in the first period again to beat Winnipeg. Dillon Dube, Matthew Tkachuk, Mark Jankowski, Johnny Gaudreau and Derek Ryan also scored for the Flames (13-8-1), who moved back into first place in the Pacific Division. Calgary became the fourth team in NHL history and first in nearly 30 years to score five or more goals in consecutive first periods. The Flames also scored five times in the first Monday against Vegas in a 7-2 win. Making his third consecutive start with struggling Mike Smith on the bench, David Rittich finished with 37 saves to improve to 8-1-0. He’s won five straight. Patrik Laine scored two goals and Brandon Tanev had the other one for Winnipeg (12-6-2). LOS ANGELES (AP) — Nathan MacKinnon, Vladislav Kamenev and Colin Wilson scored power-play goals for Colorado. The Avalanche have scored three power-play goals in two of four games, going 8 of 11 with the man advantage in that span. Patrik Nemeth, Tyson Barrie, Nikita Zadorov and Matt Calvert scored at even strength. Alexander Kerfoot had three assists, and Mikko Rantanen remained the league’s scoring leader with two assists to increase his total to 34 points. Semyon Varlamov made 33 saves. Kyle Clifford, Matt Luff and Austin Wagner scored for Los Angeles. Cal Petersen allowed six goals on 31 shots before leaving early in the third. RALEIGH, N.C. (AP) — Trevor van Riemsdyk and Justin Williams scored 22 seconds apart in the first period, sending Carolina past Toronto. Curtis McElhinney made 30 saves to help Carolina snap Toronto’s four-game winning streak. Micheal Ferland, Sebastian Aho and Andrei Svechnikov also scored. John Tavares and Kasperi Kapanen scored for Toronto. The Maple Leafs are 9-2 on the road. DETROIT (AP) — Andreas Athanasiou tied it midway through the third period and scored 49 seconds into overtime to lift Detroit past Boston. Jimmy Howard stopped 34 shots and Tyler Bertuzzi also scored for Detroit. The Red Wings have won nine of 11 and are over .500 (10-9-2) for the first time this season. Jakob Forsbacka Karlsson and Chris Wagner scored for Boston. NEWARK, N.J. (AP) — Pavel Zacha scored twice, Taylor Hall had a goal and an assist, and New Jersey beat Montreal. Kyle Palmieri and Nico Hischier also scored for the Devils, and Keith Kinkaid stopped 24 shots to end the team’s two-game skid. Jonathan Drouin and Max Domi scored for Montreal. Domi has a point in 11 straight games. Carey Price made 23 saves. NASHVILLE, Tenn. (AP) — Pekka Rinne made 28 saves to set an NHL record for wins by a goalie from Finland, and Nashville spoiled Craig Berube’s first game as St. Louis’ coach. Rinne earned his 320th career victory, surpassing Miikka Kiprusoff for most by a Finnish-born goaltender. Frederick Gaudreau, Filip Forsberg, Austin Watson and Ryan Ellis scored for Nashville. Robert Thomas had the lone goal for the Blues. Berube took over as interim head coach Monday night when Mike Yeo was fired. ST. PAUL, Minn. (AP) — Eric Staal scored his second goal of the game with 5:58 left and Minnesota overcame a sloppy third period to beat Ottawa. Matt Dumba also scored twice to help the Wild end a two-game slide and win for the 12th time in 17 games. Mikael Granlund had three assists. Chris Tierney, Thomas Chabot, Christian Jaros and Colin White scored for Ottawa. GLENDALE, Ariz. (AP) — Max Pacioretty stuffed in a rebound at 3:36 of overtime to lift Vegas past Arizona. Pacioretty also scored in the second period, Tomas Nosek had a goal and Marc-Andre Fleury made 19 saves. Derek Stepan scored twice for Arizona, and Darcy Kuemper had 20 saves.